Philip A. Buck: The Letter B is for Baby Brooklyn!!! The Letter B is for Baby Brooklyn!!! Hey guys! Wow, it has been a little while since I've posted on the site. But rest assured it just means I've been busy making art (and having a little Summer fun with the family!) I really wanted to share with you all something that I had a lot of fun making recently. One of my best friends, Antonio, and his awesome wife, Lindsay had their first child this Spring! So Incredibly cool! Their beautiful little girl's name is Brooklyn and she is super cool. So cool, in fact, that my girlfriend and I wanted to give her something extra special. Luckily we happen to know someone who can paint cute animals in watercolor (It's me guys.) Above is a photo of the final watercolor painting we gave Brooklyn and her parents. Here is just a page of the sketches I did while trying to plan and figure out the painting. The goal: super cute baby animals acting like human kids. The inspirations: the works of Richard Scarry, Adam Rex, actual baby animals, and actual human kids. Above, you can see how it looked right after I finished it! ...and my bare foot. Below, you can see the animal kids having a real grand time doing fun things that animals and kids like to do. 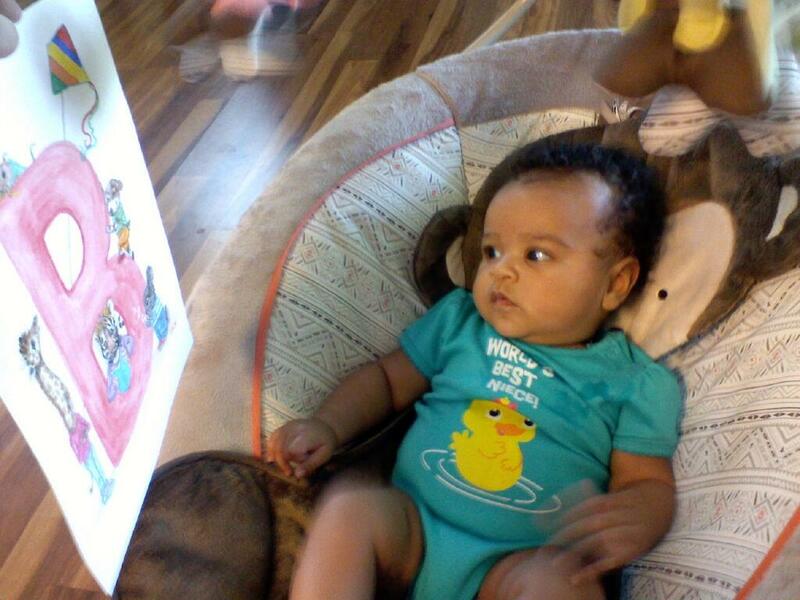 After receiving the painting in the mail, Brooklyn had her mom send us a photo of her observing the painting. You can tell she really digs it. Thank you for also observing the painting and a little bit of my process. God bless you all and have an outstanding and pleasant week!